On average, at age five we engage in creative tasks 98 times a day, laugh 113 times and ask 65 questions. By age 44, the numbers decline drastically to two creative tasks a day, 11 laughs and six questions. ― Study conducted by the University of California (UCLA). Travel tends to bring out the best and worst of us. Confusing situations, unfamiliar foods, indecipherable languages, inevitable delays ― they are all part and parcel of the travel experience. It’s how we choose to deal with them that defines our experience. Gripe on everything that’s different from home like a grumpy old man? Or embrace those “same same but different” elements with the wideeyed wonder of a child? “All the pathos and irony of leaving one’s youth behind is thus implicit in every joyous moment of travel: one knows that the first joy can never be recovered, and the wise traveler learns not to repeat successes but tries new places all the time,” said historian Paul Fussell. So it was that I was determined to tap into my Inner Child, the Wonder Child, my True Self ― that part of each one of us that revels in playfulness, innocence, wonder and joy ― in the most unlikely of places, Bangkok, the City of Angels but perhaps better known for its devilish adult pleasures. 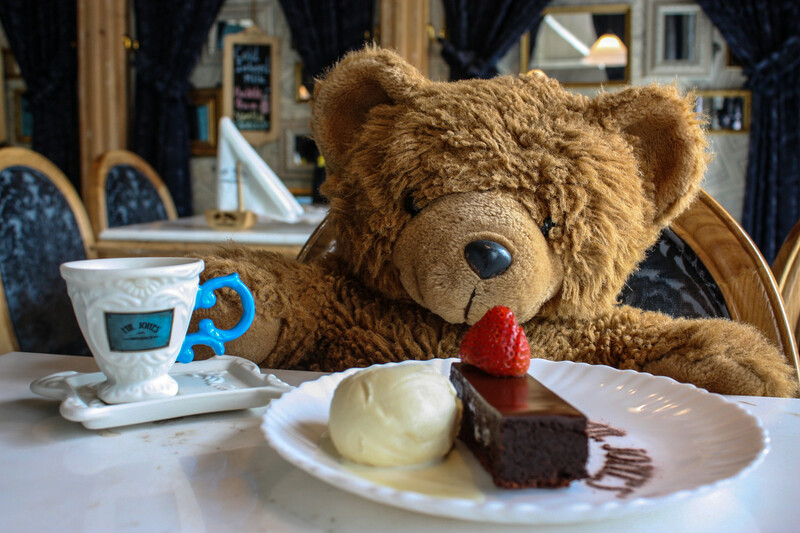 Teddy bear tea parties find their adult reincarnation at the whimsical Mr. Jones’ Orphanage, a cake shop straight out of a children’s book. “The concept is a fantasy, of an old man building an orphanage in an abandoned building, allowing children to do things their parents would have forbade like eating a lot of sugar, cakes and milkshakes,” explains creative director Roberto Giordano. Gothic gargoyles line the façade of the shop, while the interior is designed to look like a conservatory set in an old church. The main entrance evokes the nave, while dozens of teddy bear “orphans” (complete with individual information cards) look on from the balconies. One side of the bakery houses an open kitchen which produces everything fresh daily, the irresistible smell of cookies, waffles, pancakes, and crème caramel settling like a blanket of unadulterated joy over the magical space. On the other side of the shop, a gigantic carousel is set to host the mother of all tea parties, with more teddy bears seated around the room, while wooden carousel horses and hundreds of paper airplanes dangle above. While the low ceiling of the upstairs library is perfect for wee ones to run around, the clientele is decidedly adult. “It’s one of the most creative spaces in the city,” says Pamela, here on a Thursday afternoon with a girlfriend, sipping a Wanna Wanna Have milkshake (vanilla caramel, chocolate, macadamia nuts) and slowly savoring a slice of Mr. Jones’ Secret Cake (shhhhh… the “secret” is Grand Marnier). Mr. Jones’ Orphanage is one of the playful venues owned by the Fico Group, which also counts the Dickensian factory-themed Iron Fairies bar and restaurant, the 1940’s USA bomb factory-themed gastro pub Bangkok Betty and Maggie Choo’s, the chic Shanghaistyle underground cabaret bar, in its portfolio. Since opening its first store in the Thong images provided by magic art museum “All the art is made by Thais, either artists or students from famous universities. And 80 percent of our guests are adults!” 76 Mr. Jones’ Orphanage Baan Silapin 77 Lor area of Bangkok in 2012, success has come quickly, striking a chord with adults looking to indulge their sweet tooth in a playful setting. A second Mr. Jones’ Orphanage opened the following year in Siam Center, centered around a train theme. Tracks suspended in the air run through the space, and large moving wooden gears adorn the ceiling. “Trains are important to this location,” says Roberto. “There’s a connection to a real train at the [attached] BTS station and you can get on the train that takes you to Sugar Hills,” the massive cake display housing dozens of desserts including Kit Kat Cakes and Chocolate Mud Pies. Four other Bangkok locations are set to open this year and the bakery has franchised its first international location in Sapporo, Japan with 14 more of the dessert restaurants to roll out over the next three years. Visit the original Mr. Jones’ Orphanage at SeenSpace Thonglor 13, Bangkok. Other locations include Siam Center, Empire Tower and Central World. Milkshakes and cakes start at BHT130, with waffles, pies, pancakes, cupcakes, cookies and a selection of savory items rounding out the menu. Forget Kermit and old socks with button eyes. 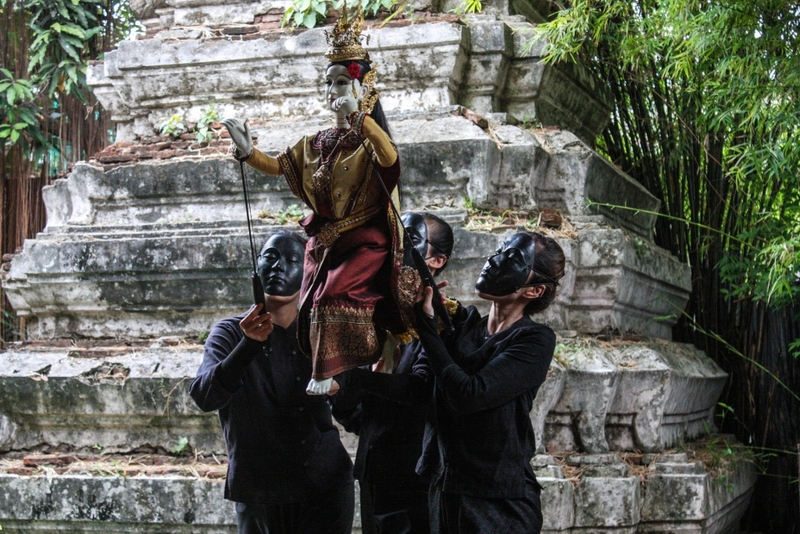 Baan Silapin, or the Artist’s House, is where adults can enjoy classical Thai puppetry. Set in an old wooden house directly on Klong Bangkok Yai, an offshoot of the Chao Praya River, Baan Silapin is a space dedicated to the love of art. “The owner is an artist, an architect,” says Lalita, one of the members of the Kum Nai Hun Lakon Lek puppet troupe. “He wanted to make this gallery to show artwork and [the process of making art, like] painting and woodcutting. It’s for art, not for business.” There’s an exhibition space upstairs and you’ll often find local students sprawled about, sketching and drawing. There are free classes on puppetry and Thai classical dancing on the weekends. The main attraction, though, is a short puppet show performed by Lalita’s puppet troupe. Unlike Vietnamese water puppetry where puppeteers are hidden behind screens, the professional Thai classical dancers are clothed all in black with full black face masks, gracefully moving in sync with the puppets they control. It takes three people to operate a single puppet, one each to control the right hand, the left hand and head, and the feet. Today’s performance tells of the monkey god Hanuman capturing Benyakai and involves a war, a fake corpse and some serious puppet smooching. Puppet shows daily at 2pm except for Wednesdays and Sundays, but calling ahead (02-868-5279) to check the schedule is recommended. While Baan Silapin is becoming increasingly popular with river tours, it is possible to get there by taxi (access via Charan Sanitwong Soi 3 or Phetkasem Soi 20). Admission is free and there is a small coffee shop on-site along with very reasonably priced gifts and postcards. What kid doesn’t dream of a future filled with robots programmed to serve our every whim? The future is now at Hajime Robot Restaurant. Customers order food using a tableside touch screen and a countdown timer lets you know when to expect the giant Japanese robot to zip along a German track motion system bringing your dishes to the table. “Hajime means beginning or first,” says Chatchanat Paojaroen, Senior Operation Department Manager. “The owner visited a robot exhibition in Chiang Mai and came up with the concept to have robots serve food to customers, the first ever restaurant with this concept in Thailand.” Our conversation is interrupted by “Gangnam Style” blaring over the speakers as the robots launch into a full-fledged dance, complete with cowboy hand movements, one of seven songs on rotation every 30 minutes (more often if there are a lot of children), including Thai and Japanese favorites. “I think what attracts people is the robots,” says Chatchanat. “But the ambience and the high quality menu ingredients bring them back.” Nearby office workers crowd the restaurant during the week while weekends are dominated by families looking to feast on the New Zealand beef and Japanese Wagyu, tiger prawns, salmon steaks, lamb chops and as much sushi as you can eat in an hour and a half. 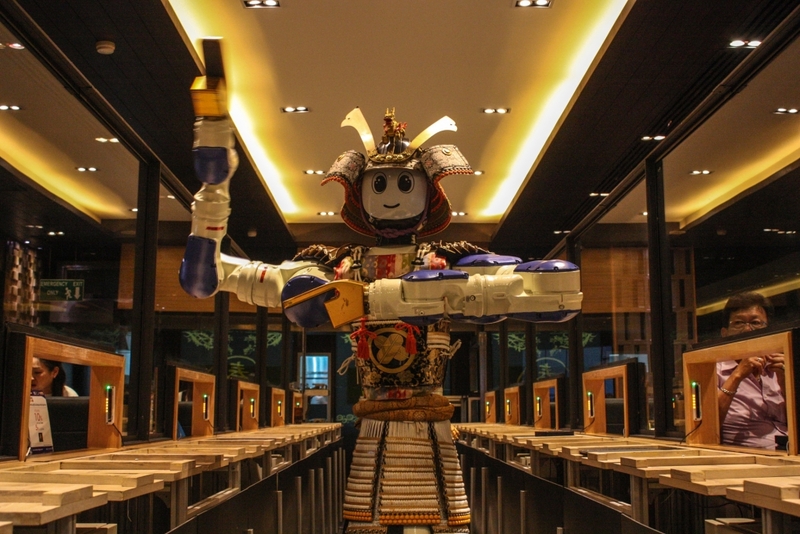 The 144-seat restaurant came at a 30 million baht investment with an even larger restaurant operating in Pattaya and one with talking robots planned for Chiang Mai early next year. Few things evoke happy childhood memories like a backyard tree house. No rules, no chores, no parents. Pull up the ladder and you’re in your own world with a best friend for company or maybe just a stack of comic books or a boxful of baseball cards. 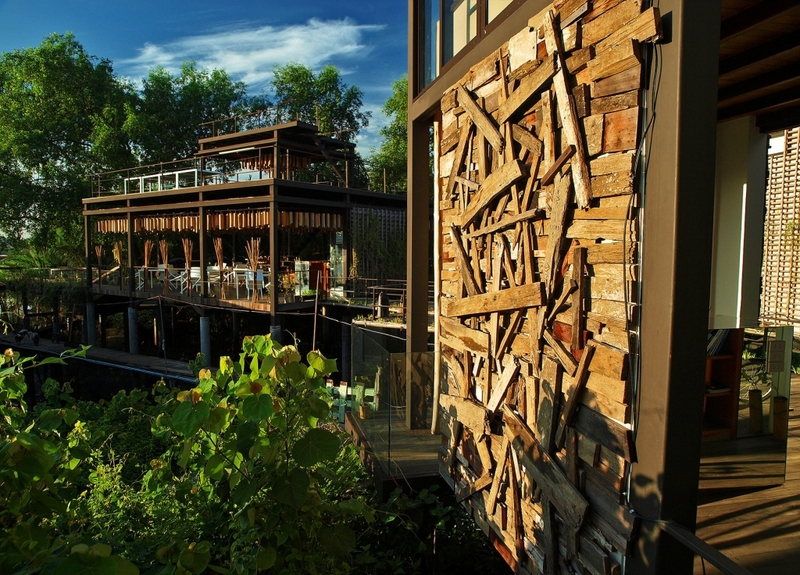 Weary city dwellers in the know escape to the Bangkok Tree House, a collection of 10 themed “nests” set on Bang Krachao, an unexpected island oasis of green just across the Chao Praya River from downtown Bangkok. 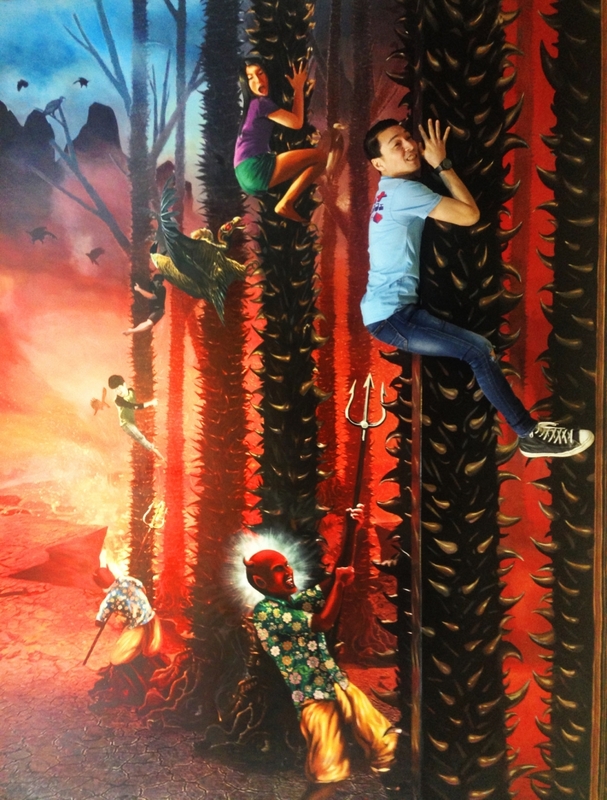 Each room has a different theme, including larger-than-life butterflies, fireflies and ants. The hexagonal bamboo latticework evokes a honeycomb structure in the Bee Hive room, while all the “nests” have a lovely indoor/outdoor area with rainfall showerheads enclosed by bamboo privacy screens. The website even lists a River Nest comprised of an inflatable bed set in the middle of the Chao Praya River. While the hotel is definitely green, using solar and wind power to generate electricity for the outdoor areas, it’s not quite that green. “That was for a photo shoot,” explains Digital and Social Media Manager Rinrada Kroeksupharak. “Water levels are unpredictable, then there are the waves from the boats. We wouldn’t want our guests waking up in the middle of the ocean. But a lot of guests have been asking about it, so who knows?” she says. For guests who tire of lazing on the rooftop hammocks or watching life roll by on the river while having free pineapple mint ice cream, complimentary bicycles await to explore the island. Nearby, there’s the Ban Nam Pheung Floating Market (although a misnomer, as the market is by the canal, with very few boats actually on the water) and a 200-year-old wat featuring a giant Buddha statue. Ride past the Joss Stick House with its classes on incense stick making to the other side of the island to find the quirky Siamese Fighting Fish Gallery with dozens of jars housing colorful Thai bettas of every variety. In the evening, set aside an hour or so to go on one of the hotel-organized firefly boat tours, checking out the lampu trees along the shore that flicker like Christmas trees with hundreds of fireflies. The boat owners are trained by Kasetsart University, known for its research on fireflies, and a hotel staff member will come along to translate. “This area really is special, particularly because it is so close to Bangkok,” says Joey. “We can’t stop development, but we all can try to make the development fit in with nature as much as possible, meaning… letting the environment determine the design.” For the nature-loving kid-at-heart, the firefly tours and all-day ice cream are just a bonus to this urban tree house getaway. Doubles start at BHT 4,590, inclusive of breakfast and fireflies boat tour. To get to the hotel, take a taxi from the Bang Na BTS station to the Bang Na Pier. Public ferries leave every 20 minutes for the five-minute crossing. A short 400 meter walk along the elevated sidewalk takes you to the hotel. See www. 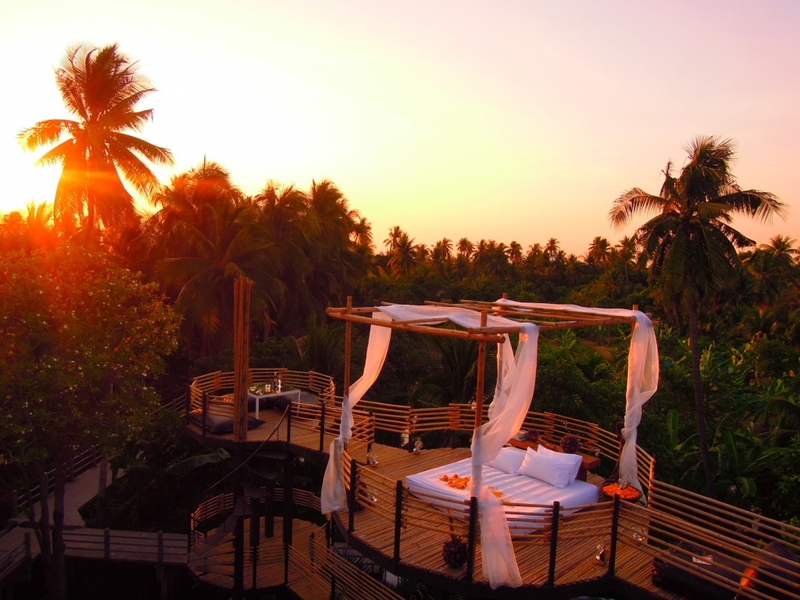 bangkoktreehouse.com Comedian Gilda Radner once said: “While we have the gift of life, it seems to me the only tragedy is to allow part of us to die, whether it is our spirit, our creativity or our glorious uniqueness.” Here’s to your Inner Child leading you to wonderful places on your travels!